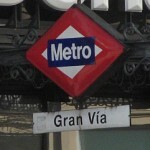 Gran Via, translated Great Way, is a fantastic street in the centre of Madrid. Today you can find a mixture of shops, theatres, hotels and beautiful buildings along this road strecthing itself from Calle de Alcalá (almost Plaza de Cibeles). The started building this street in 1904 and it was finished by 1929. 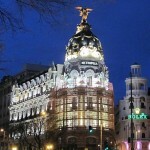 Near Plaza de Cibeles the famous Metropolis building can be seen made between 1907 and 1911. 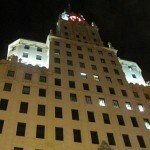 Another famous building is the Telefónica Building, a skyscraper 88 metres high which was the highest building in Madrid as it was finished in 1929. As you get closer to Plaza de Espana you will find quite a lot of theatres around together with some restaurants and shops.